This was one of the discoveries to inspire my trip, being able to get from Bexhill, UK to Beijing, China entirely by train. I have not left land at all, starting with the local train to Ashford the Eurostar took me to Brussels where the Thalys connected me to Cologne and a sleeper train left Cologne and arrived in Minsk for midnight. Another sleeper train travelled from Minsk to St Petersburg, and another from St Petersburg to Moscow, where the Trans Siberian (Mongolian branch) Rail journey started. Travelling through Europe, Russia, Mongolia and now into China, the landscape has altered markedly. The language, currency, culinary delights (or otherwise) and people have changed at each stage. On board the train there is only chance to see a small snapshot of this, although the train carriages and station platforms offer a unique view point. The train attendants, platform offerings from locals and fellow passengers are distinctive between each country, and probably region if I was to pay enough attention and time. With the landscape providing a backdrop for all this, the ten nights spent on board trains so far, has been as varied as much as it has been similar. The minutiae of life on board circles around your basic needs of eating, drinking, sleeping, washing (or not) and using the toilet (or not). These vary in their priorities depending on what is most lacking at any particular time. At another level, the fascination of watching out of the window does not lose interest, all the while the train is moving there is something to see. Only during lengthy periods of being stationery does frustration and boredom set in. Prolonged border crossings remain tiresome and illogical while each country has its own style and process of paperwork, passport checks, baggage checks, routines of locking toilets for hours at a time and switching off lights so you are sat in darkness. You might suspect tactics of intimidation or think they wish to make the process as uncomfortable as possible. So far I have spent 10 nights on board a train, crossed 9 countries, altered my watch 10 times, sat at border crossings for 17 hours and been asked for my photograph once because I am so odd looking. It was with great amusement that a Chinese gentleman spotted me and wanted his photograph taken while climbing another 5 steps of the Great Wall to stand level with me. It has been a fast paced start to the trip so I am not so worried that the next few hours will be spent at Beijing West Railway Station waiting for my next train to Xi’an. 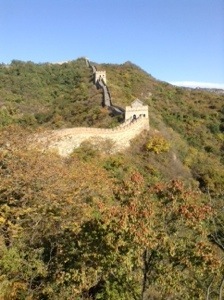 The Great Wall at Mutianyu has to be a highlight. 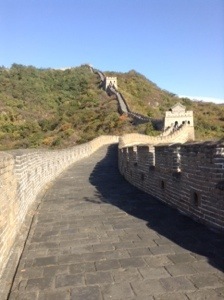 Largely restored you are able to gain a sense of the expanse and distance the wall travels. Arriving early also gives opportunity to explore in more quiet contemplation, coming back down some 4 hours later you emerge in a different place to the one you left, with vibrant bustling market stalls and enthusiastic saleswomen offering souvenirs and food, rising from a near deserted landscape. Watching the monks in prayers at Ulan Bataar is another memorable experience, the highly decorated and colourful monasteries adorned in silk hangings and ornaments with offerings. The hypnotic sound of the chanting resonated around the space, with younger monks shuffling in their seats or arriving late, bringing a more human aspect to the spiritual environment. In stark contrast, the high speed train has just departed Beijing, flying at a 297km/h. It has got dark earlier here so I wont have a chance to see the countryside. I am surrounded by screens and information, variably in Chinese and English. I am hoping to be able to upload some more photographs soon. 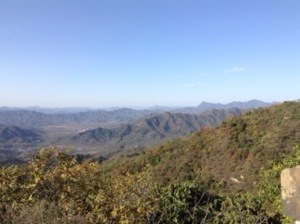 This entry was posted in Bexhill, train travel and tagged Beijing, China, Europe, Russia, Trans Mongolian Railway on October 20, 2013 by Louise Kenward.